It is one of Asia's fastest growing industries and shows no signs of losing steam even as the global economy wobbles. Travelling abroad for medical treatment is now a multi-billion dollar business. From a nip-and-tuck to a heart bypass, hospitals from India to Singapore and South Korea treat more than 1 million foreign patients a year — lured by cut-price surgery, no waiting lists, cutting-edge technology, and highly trained doctors. Industry experts predict medical tourism in Asia will grow at a rate of 15 to 20 percent a year, mainly due to the emergence of nouveaux riches in the region. "Asian medical tourism ... seems to be increasing as affluence and mobility increase in Asia," said David Vequist, head of the Center for Medical Tourism Research at the University of the Incarnate Word in Texas. "Consumer choice is a powerful force now in healthcare and is impacted by ageing and increasingly heavier, sicker, and more needy populations in Asia." Medscape News web site has forecast medical tourism in Asia could generate $4.4 billion by 2012. The United States provides the most patients, as Americans travel abroad to avert the astronomical costs of having private treatment at home. Typically, Americans can save 40-50 percent. But there is a new patient on the operating table, and that patient is Chinese. Many of these patients are willing to spend what it takes to fix their problem. "No matter how expensive it is, I will go for it," says Liu Xiao-yang, 34, of Shanghai, after having double-eyelid surgery, a facelift and corrective jaw surgery in Seoul. The rise of an affluent class in China, and an infatuation with the upsurging Hallyu, or Korean Wave, culture from pop music to drama have spurred a sharp growth in South Korean medical tourism, mainly in the field of cosmetic surgery. "Every time I watch South Korean drama and TV shows, I feel that they are pretty and I want to look like them," says Liu. 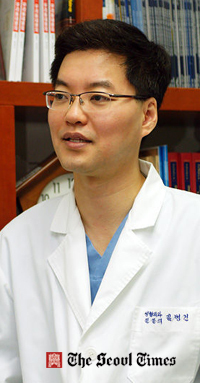 Kim Byung-Gun, a plastic surgeon and director of the BK DongYang Plastic Surgery Clinic in Seoul, says his patients have ranged in age from 6, for double-eyelid procedure, to a 70-year-old seeking a skin lift. On average, they spend $5,000-$10,000 per procedure. "Medical tourism is going to be one of the growth engines of the South Korean economy," Kim says, identifying the Korean Wave as a key contributor to the rapid growth of the sector in Asia's fourth largest economy. South Korean authorities have every reason to be optimistic about the growth of the industry, particularly in the field of elective cosmetic surgery. CLSA Asia-Pacific Markets in a study released last month estimated that China would account for 60 percent of the rise in high net-worth individuals' wealth in Asia over the next five years. Chinese patients arrive in South Korea with photographs of Korean celebrities they want to resemble, says Lee Soo-jung of the Lamar Plastic Surgery Clinic in Seoul. Han Dong-woo of the Korea Health Industry Development Institute says the number of tourists coming to South Korea ballooned last year to nearly 82,000, generating about $700 million in revenues. Three years earlier, fewer than 8,000 medical tourists travelled to South Korea. Han projects some 200,000 will come next year. By 2020, the South Korean government envisages a million medical tourists a year. "I see an infinite growth potential in the plastic surgery market for foreigners," says Han, who estimates operation costs in South Korea are about half that of the United States. South Korea may be one of the fastest growing medical tourism destinations, but for now it lags far behind trailblazers Thailand, Singapore, India, Malaysia and even the Philippines. They all have their own distinctive marketing strategies in an attempt to woo clients, as well as areas of specialization. Thailand and India, Asia's leading destinations, specialize in orthopedic and cardiac surgery. India's government says its medical services are cheaper than those in southeast Asia, and identifies its English-speaking doctors as providing a "major comfort factor". It has even introduced a special visa category to account for the growing number of medical tourists. Thailand sells itself as dual purpose destination where medical treatment can be combined with a cheap recuperative holiday. Bangkok was this year identified by TripIndex as the best value global city for U.S. travellers. The Singapore healthcare industry positions itself as a "premium" centre. Among its patrons have been many of Malaysia's sultans, as well as other high profile political figures and celebrities from Asia and the Middle East. By next year, Singapore aims to treat a million foreign patients a year, generating about $3 billion for the economy, the Singapore Straits Times has reported. Its area of expertise includes cancer treatments, cardiology and other specialized care. Like South Korea, it sees China, as well as India, as being the catalysts for growth. Neighbouring Malaysia, attracted nearly 400,000 medical tourists last year, and aims to increase that number to 1.9 million by 2020, mainly by way of undercutting Singapore. A health official said costs in Malaysia are 30 percent cheaper than the city-state to the south. The Philippines also sees itself as a cut-price destination, and is projecting the number of medical tourists to hit one million by 2015, generating at least $1 billion in revenue. It targets patients from the United States, Canada, Taiwan and Japan. "We can compete with the rest of Asia because we have an edge in providing high quality medical and dental services but at a much lower cost," said Marie Recarro, an official at the Department of Tourism in Manila. Some experts, however, lament the rise of the medical tourism industry, saying it exacerbates a brain drain of talent from the state to the private system, from rural to urban areas. A paper published in the International Journal for Equity in Health last year said specialists were being swayed by the higher wages and better technology of the private sector. If the industry achieved even a fraction of its projected growth "this could ultimately lead to locals being priced out of their own health care system, as demand from foreign patients can drive up the costs of providing care for everyone", it said. Experts cite other concerns such as medical errors, lax follow-up care, and insurance, regulatory and ethical issues. The World Health Organization said in a report late last year that rapid development of medical tourism had presented "considerable implications for public health". It said that with the influx of foreign patients, the demand for and price of healthcare might rise. "In addition, an increasing number of health services might cater to the needs of foreign patients and neglect local needs," it said.